Dont be held back by what happened yesterday, the day before, the week before, the year before, and so on. Stop trying to please other people or be someone else. Its better to be an original version of yourself than an exact duplicate of someone else. Dont be like the howling dog, always howling and never doing anything. Stop complaining about your problems and work on them instead. Stop waiting for others around you to do something and take action yourself instead. Dont think about things you cant change namely what has happened and thoughts of other people or unhappy things because these are disempowering.Instead focus on the things you can action upon. Thats the most constructive thing you can do in any situation. Focus on WHAT you want first, before you think about HOW to do it. Anything is possible, as long as you set your mind, heart and soul to it. You can wait for opportunities to drop in life. Or, you can go out there and create your own opportunities. The latter is definite and much more empowering. In the Map of Consciousness, there are 17 levels of consciousness from Shame to Enlightenment. The higher level of consciousness you are in, the richer your life experience. Achieving higher consciousness comes from your commitment to growth. This means knowing who you are and what you represent. 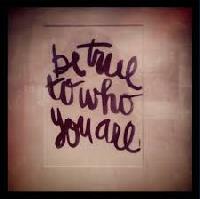 Be clear of your personal identity.